Salbu Experimental Radio Station : 1924 -1994 - The first licensed Salbu Experimental Radio Stations were established in Natal by the cousins Gustav and "Wireless Windy" Larsen. The first licensed Salbu Experimental Radio Stations were established in Natal by the cousins Gustav and "Wireless Windy" Larsen. Windy's receiving station was first licensed on the 21st of April 1924 and the transmitting station was licensed on the 26th of July 1926. Gustav died on the 22nd of August 1947 and his station call sign, and equipment, passed to David Larsen. 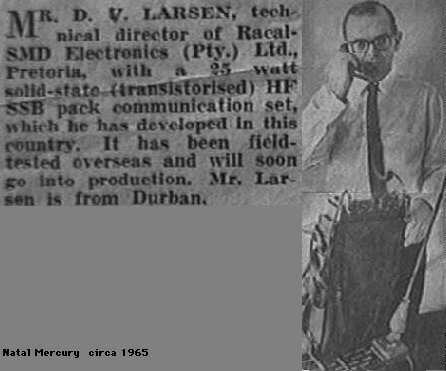 In 1952 David Larsen joined SMD and moved one of the Salbu Experimental Radio Stations to Pinetown. The station was again moved in 1965 - a few years after the establishment of RACAL-SMD in Pretoria - to the present site, on the farm Doornkloof. 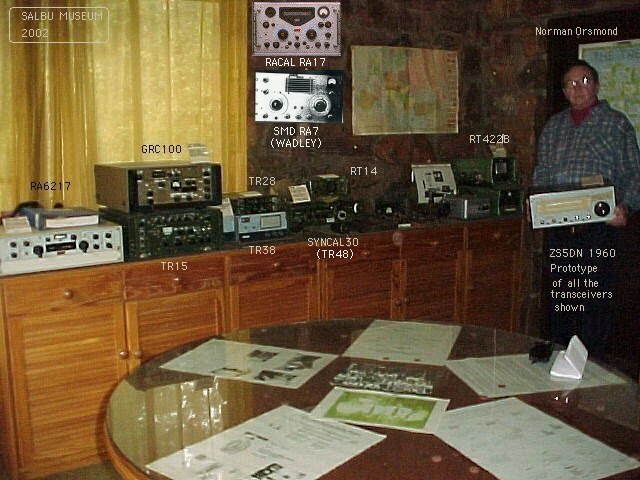 Salbu, in the early 1960's, built, and evaluated on the amateur radio bands, a unique range of both "tuned" and "broad-band" SSB, Solid State, Transceivers. The "tuned" prototype was further developed and manufactured by SMD in Pinetown and later by RACAL-SMD in Pretoria - large numbers of the RT422B SSB Transceivers were soon in use throughout Africa. The "broad-band" SSB, Solid State, Packset Transceiver concept was initially rejected in the UK as "fundamentally unsound". The concept being later enthusiastically accepted by RACAL after the RACAL-SMD RT14 Packsets had been successfully evaluated - under battle conditions in the Malaysian jungle - by the British Army. As a direct result of the Malaysian trials RACAL received their "biggest order ever" for a product based on concepts deemed to be "unsound." In the early 1970's, Salbu evolved and demonstrated a "thin line troposcatter system". This concept resulted in the development of the TR450 and TR600 VHF/UHF transceivers. In the early 1990's, under desert conditions, the TR450 completely "out-ranged" all international competitors. This "thin line" concept "once again rejected by experts" was some 15 years ahead of its time. In the mid-1970's, as a direct result of Salbu's investigations, HF "Frequency Hopping" techniques were developed at RESA and the TR15H, TR48H and GRC100 tactical HF radios were successfully introduced to both the local and international markets. The AFCEA report (Defence Attach* No4 of 1983) under the heading "Milcom's show-stealer" refers to both the MILCOM GRC100 and MILCOM PRC150 tactical radios designed to hop in the HF band and states "there can be no greater tribute than to record that the PRC150 was often hidden from view by a throng of observers from rival companies, many of whom came away looking distinctly shell-shocked - the GRC100 is claimed to be the first "frequency hopping" HF radio to enter production as long ago as 1978." A subsequent article in Janes Defence Weekly, dated 11 July 1987, states "Frequency Hopping is probably the most popular spread spectrum technique. Claimed to have been pioneered in South Africa, it now appears in tactical equipment manufactured or marketed by companies including Elta, Ericsson, Harris, ITT, Marconi, Magnavox, MEL, Plessey, Racal, Reutech, Rockwell, SEL, Siemens, Tadiran, Telemit, Telettra & Thomson. In the late 1970's Salbu established the basic parameters for "Compound HF Frequency Hopping", "Parrot Relay", "Meteor Burst" and "Thin Line Satellite" communication systems" - Salbu initiated informal negotiations for "Parrot", "Meteor Burst" and "Intelsat Ground Station" licences. In 1981 - after graduating from the University of Natal - James Larsen joined Salbu and an academic research team was established. This team undertook a number of research projects. The "Meteor Burst Communications Research Programme" resulted in an internationally accredited "Computer Model for Meteor Burst Link Analysis". Six of the junior scientists involved in this project received doctorates and funds were raised for an MBC Development Project. The Salbu Research Group established definitive parameters for, and demonstrated, working "Meteor Burst" and "Thin Line Satellite" Communications Systems". In March 1993 Salbu was granted an experimental "Intelsat Ground Station Licence". In the early 1980's, apart from demonstrating the feasibility of "Programmable Automatic Relays with Revert back checks of onward Transmissions" (PARROT) and "Compound HF Spread Spectrum Techniques," Salbu undertook a "Stand-Off HF SSB Repeater System" study and evaluation programme. Various "Stand-Off HF SSB Repeater Systems", including "Single Frequency Repeaters", were demonstrated to potential users. This programme initiated the development of a number of products. In the late 1980's Salbu undertook the Research and Development of a range of Meteor Burst and Thin-line C-Band Satellite Communication (C-MITT) products - some of these products have been successfully evaluated on operational networks and are presently in the process of being industrialised - Salbu was granted frequencies and licensed to operate Nation-wide Commercial Meteor Burst Communications Networks. During 1987 and 1989 Mark and Gernot Larsen, both university graduates, joined the Salbu team. In May 1989, the State President awarded "The Order of the Star of South Africa (Non Military), Grand Officer (Silver)", to David Larsen in recognition of his contribution to electronics over the years. Apart from the Thin-line C-Band Satellite System, Salbu has undertaken an investigation into Intelligent/Expert Macro and Micro "Cellular Microwave Interactive Television and Telecommunication" (C-MIT2) Communications Systems. Over the decades Salbu has developed, built, demonstrated and evaluated a range of innovative state-of-the-art multimedia wireless communication equipment and systems complete with supporting software. A far cry from the humble "Wireless Shacks" of the 1920's, today the Salbu Experimental Radio Station is located on a 120 acre property located east of Irene - on high ground, adjacent to a game reserve - between the cities of Johannesburg and Pretoria. The Radio Station is well equipped with antennae ranging from large HF Rhombic and Yagi Arrays to Microwave and "Satellite Communication" Antenna Systems - the station facilities are augmented by the modern laboratories of the Salbu Research and Development Establishment (SRDE). Note: See the Salbu Museum for reports, photographs, equipment, evaluation models and the 1972 & 1992 Press statements by the RacalUK Chairman. Racal Electronics, South Africa's biggest exporters of communications equipment and part of the R40 million-a-year Racal international group of communications experts, today announced changes at top managerial level. Mr. H. Dainty, Managing Director and a leading figure in the development of electronic communications equipment in South Africa for the past 40 years, has been appointed Chairman. Mr. D. V. Larsen, Technical Director and the man responsible for much of the South African designed electronic equipment which has met with world success, takes over as Managing Director from Mr. Dainty, with with whom he has been associated for more than twenty years. Mr. S.J. Constance, the well-known Johannesburg director of companies, retires as Chairman but remains a Director. Two new appointments to the Board are those of Mr. R. L. Butenshaw, Managing Director of Racal Marine Electronics (Pty) Ltd with its headquarters at Simonstown, and Mr. B. Johnson, Managing Director of Racal Electronics (Natal) (Pty) Ltd at New Germany, Natal. The new appointments were announced by Mr. E.T. Harrison, Chairman of the Racal Group, when he visited South Africa this week. Mr. Harrison revealed that Racal South Africa exported 62% of its local turnover of communications equipment made in this country. He paid tribute to Mr. Dainty whose services would also be used by Racal International and to Mr. Larsen who had been responsible for the development of equipment which hod enabled Racal International to reach its dominating position, particularly in the world of military mobile communications. These included two of the biggest recent orders for military electronic equipment the manpack, the most modern of its kind in the world - amounting to R22 million. One was from the British Government for R12 million and the other from lran for R10 million. Racal UK was currently exporting more manpacks than any other company in the world and they had been developed from designs which originated through Mr. Larsen in South Africa. In addition, Mr. Harrison said that the successful invention of what had come to be regarded as the world's best communications receiver by the South African scientist, Dr. Trevor Wadley, which was in advance of anything of its kind designed in the post 50 years had earned the CSlR a substantial amount in royalties since it had been taken over by Racal. Mr. Harrison said Racal South Africa's activities had expanded considerably in the past few years and several factories and eight offices hod been established in Southern Africa. The equipment range included HF and VHF communications equipment, Microwave, Broadcasting, TV and Data equipment, Computer peripherals and Electronic instrumentation. He added that the Company would step up its export activities and would seek a listing when conditions become suitable.